This Slimline Fancy pen kit creates a slim and elegant pen that is quick and easy to turn with basic straight cuts on the lathe. Try these out with different profiles to bring out your creativity. 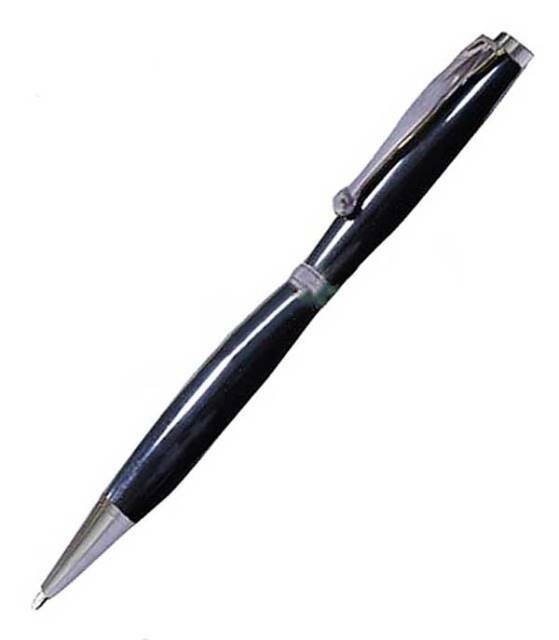 These twist pens are very popular and make super gifts. Because these pens have a diameter of just 9mm, it is possible to make up to 4 pens out of a 25mm x 25mm blank if you cut it and can drill the hole straight enough. Otherwise 13mm acrylic rods can also be used successfully. Finish: Black Titanium plating (thickness 20 microns) coated with epoxy for durability. Rounded centreband and pocket clip. This product was added to our catalog on Wednesday 18 July 2018.